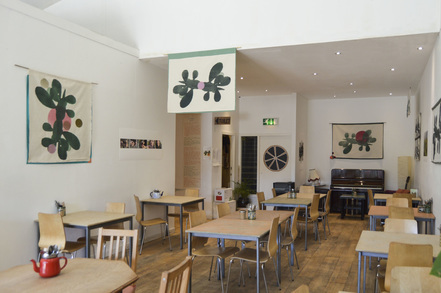 We are reaching out to invite proposals from community arts organisations/individuals within the Garnethill area to host exhibitions within The Project Cafe. This opportunity will be opened up to reach the wider Glasgow community later, however the aim is provide the platform for those who work/live/otherwise connect with Garnethill at this stage. Do you work with groups/individuals as part of projects that involve creating artwork? Do you need a space to exhibit this artwork? Or maybe you know some organisations who would benefit from linking with us to show work in the Cafe. We would love to hear from you, and to be put in touch with people/organisations who you think could benefit from this opportunity. The cafe is hosting some truly talented young artists for its current exhibition, 'Inspirational Women', and we are enjoying it very much! This exhibition is a culmination of work produced at a series of art and craft workshops involving children aged between 5 and 14 years old who worked under the auspices of the Garnethill Parents Association at the Zigzag Arts based in Garnethill Multicultural Centre. The theme of the childrens art project was women who inspire them. This included well known women working in Scotland today, women from history and women from the childrens own families. The work will be on show until Sunday 28th October. Created by Katrina Caldwell and Sarah Longfield, hand-me-down is part of the year of History, Heritage and Archaeology 2017 and funded by the Heritage Lottery Fund. Through my artistic practice, I explore our place within the natural environment and how food is our connection with earth and soil. Bread forms the base of our historical and contemporary diet all over the world, being present in our diet for at least the last six thousand years. The art of baking bread is becoming forgotten in modern society. As an act of empowerment, I can practice bread baking. Historically and culturally bread connects us with the soil – through the grains that we use, the water, the fire, the effort that we go to, the community with whom we bake and share, and the microscopic world of the microorganisms that make the bread bubble and sour. When taken out into the natural environment baking bread becomes strongly shaped by time, temperature, weather, terrain, light and fuel. I allow my work to direct its course and take me on a journey in an attempt to stay open and to learn. Through this learning process I hope to engage an audience with these journeys and actions and offer it as a potential space to contemplate and re-imagine day-to-day life. Click here to see archived photographs from the project. Marie works with poles of contradiction and the idea that one doesn’t exist without the other. To really understand what things are, they need to not be that at some level. It is constructed or found fragments of contradictions in life or contradictions of understanding in general that is put together in a new way in order to create yet another possibility of truth. This exhibition of contemporary print by David Farrar and Fionnuala McGowan, explores the boundaries of the medium by combining traditional printmaking techniques with unusual materials or methods of display. This selection of Screenprints, Etchings, Lithographs, and Collagraphs encompasses a wide range of processes including scanning, burning, rusting, crumpling and folding and incorporates materials such as ash, soil, and iron powder. Both artists graduated from The Glasgow School of Art and have since gone onto setup Mobile Print Studio, delivering pop-up printmaking workshops in and around Glasgow. If you are interested in purchasing any of their pieces, or would simply like to get in touch, please contact by e-mail; david-farrar@outlook.com & fionnuala.mcgowan@outlook.com. ​for an evening of poetry readings, art, music and wine. ​This years AiM exhibition is a unique collection of photographs revealing the world of filmmaking behind the scenes - catching those unguarded moments within the production and post-production stages, on and off the film set. 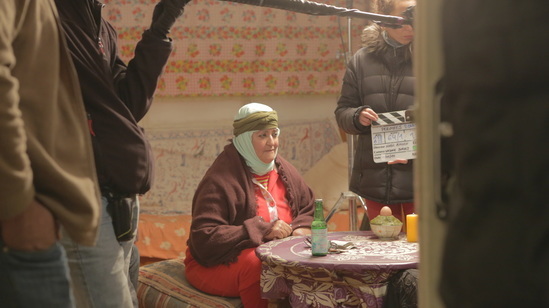 African Cinema Behind the Scenes captures the often unseen journey of cinema from story development to location scouting, to rehearsals and seeing stars, crew and directors at work! The images included in this exhibition are all photographs taken from films included in our 2016 festival programme. 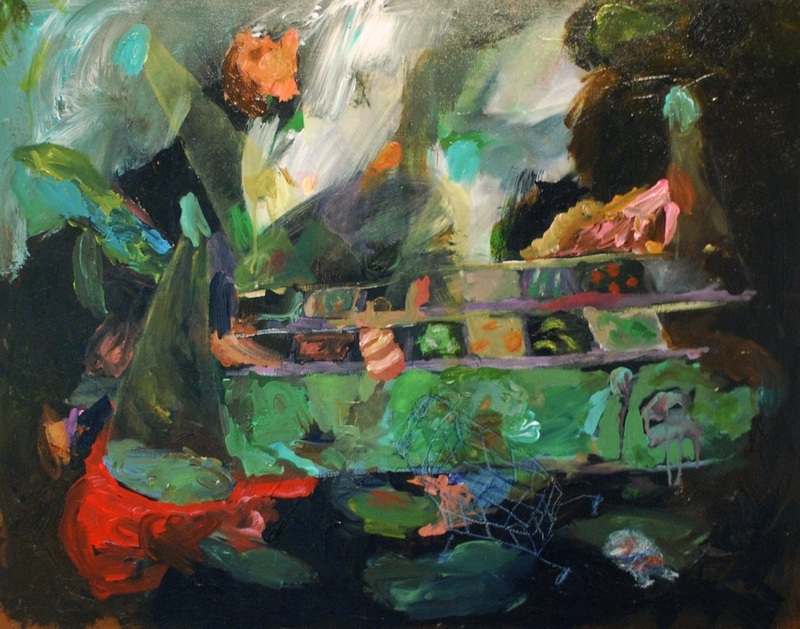 Flo Gordon's work at The Project Café is comprised of a jumble of paintings, old and new. The idea of a universal, subconscious humour provides a river upon which all of her individual projects flow. The concepts relating to each painting range from as general a topic as 'love' to 'profound thoughts in a supermarket'. Flo Gordon graduated from Duncan of Jordanstone College of Art, Dundee in 2013. She has been living and producing work in Edinburgh since. If you are interested in purchasing any of her pieces, or simply wish to get in touch, please contact by e-mail; flo.gordon@hotmail.com. An exhibition by a dear friend and loyal customer of the cafe, Frances Rennie. Frances was a strong-willed, creative woman and developed a real passion for drawing and painting which she worked on throughout her later life. All of her work was donated to the cafe when she passed away earlier this year. 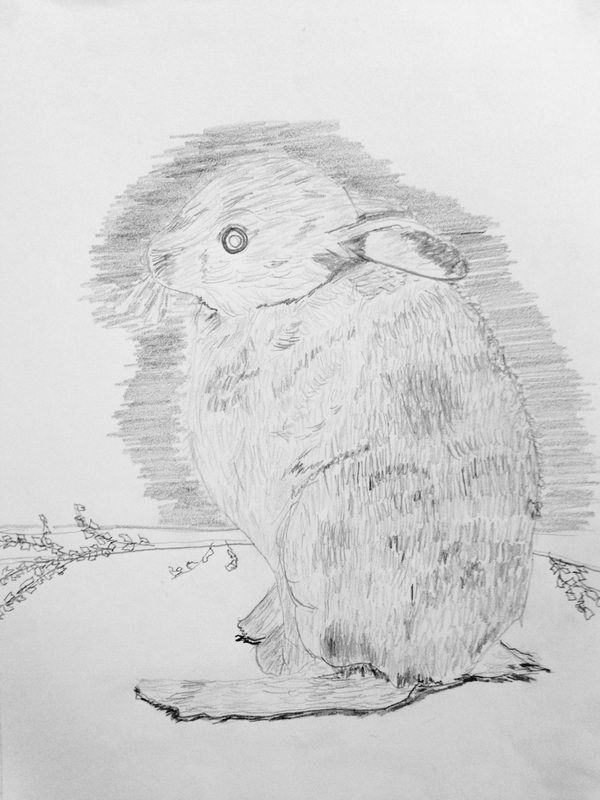 Therefore, all the work is available to purchase on a donation basis, and all money collected will be given to The Donkey Sanctuary (a trust which Frances cared for and donated to often). We hope you enjoy her delicate and considerate works. An exhibition for the Village Storytelling Festival exploring how two very different community groups see their “Village”. by The Village Sewing Group (a group of dynamic retired women from Pollok). 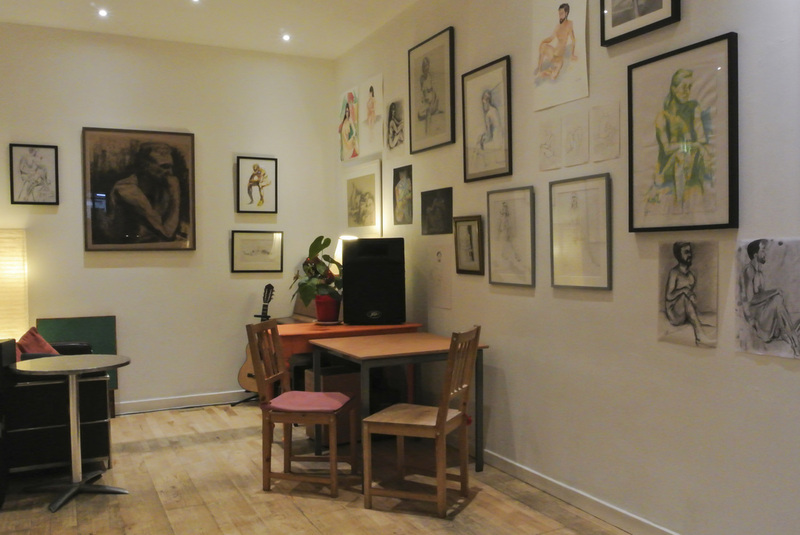 An exhibition of life drawings selected from artists who attend Sandy Grant's Art Classes in the Botanics, with additional works taken from an evening life drawing class in The Project Café. The Contents of a Pocket Artist is an exhibition of collages and drawing, consisting mainly of found objects gathered on the artist’s daily commute to her studio. It is both an investigation into the artist’s own perception of place and an endeavor to capture the essence and atmosphere of it. 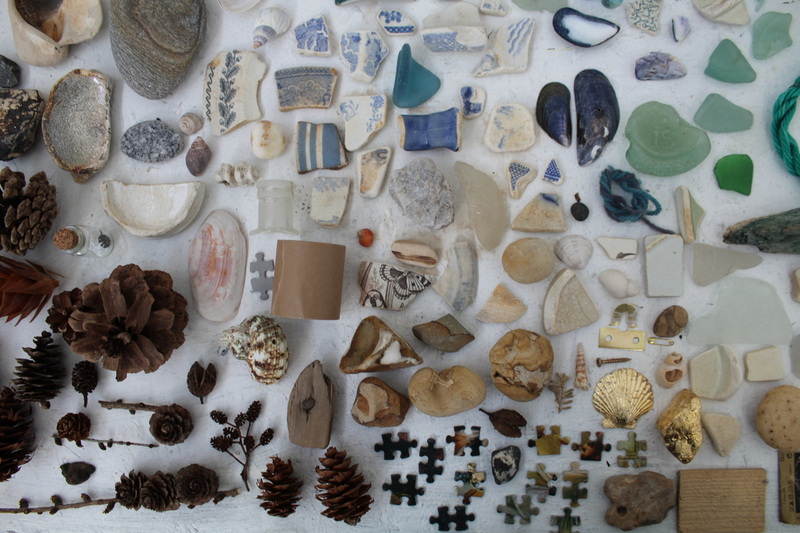 The assemblage of the objects, in-relation to one another, offers new and poetic connections that would not be present as individual entities. 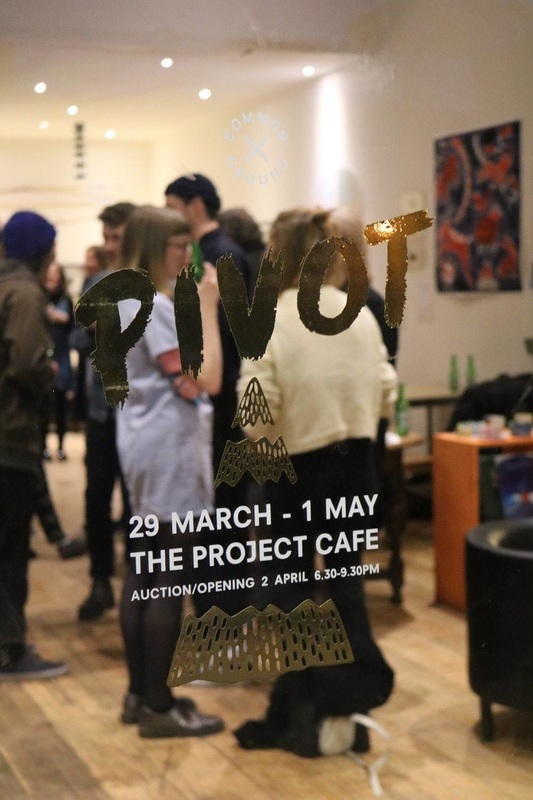 Common Ground is excited to present PIVOT, an exhibition of new artwork by 14 national and international artists, created since their participation in Common Ground Residency 2015. Exhibiting artists are: Ellie Barrett, Hazel Dunn, Emma Ewan, Caterina Gobbi, Sam Hewland, Tom Holland, Caroline Inckle, Nikki Kane, Maria McKinney, Caitlin Merrett King, Nora Sandman, Bobby Sayers, Beatrice Searle and Stéfan Tulepo.